There’s nothing quite like a warm slice of freshly baked bread with a generous smear of butter or eggs on toast with avocado and cooked tomatoes. However, for many people bread is something they’ve eliminated from their diet and these simple joys are a thing of the past. I for one certainly miss homemade bread and the lovely smell it creates when you cook it. 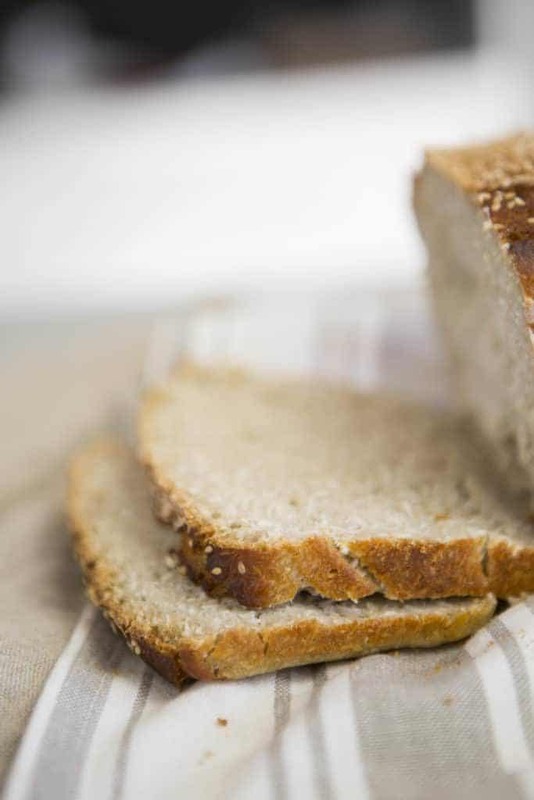 Many people have ditched bread due the fear of weight gain, to avoid grains or because they suffer from gastrointestinal conditions or food intolerances. Increasing numbers of people are becoming gluten free after regularly suffering from bloating and abdominal discomfort. The good news is sourdough bread is a little different and I want to explain why. 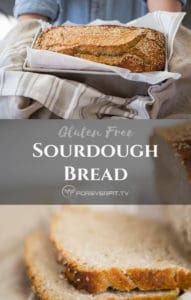 Sourdough bread is sometimes referred to as the healthiest bread and if we are to consume any bread in our diet, this is the one to start with, but of course in moderation. Don’t go eating the whole loaf! Sourdough is a term that refers to the wild or natural occurring yeast and lactobacilli bacteria. Traditionally, sourdough bread is made from just three ingredients: flour, water and salt. Unlike modern bread, there’s no commercial yeast, no additivities, no sweeteners and no milk. Sourdough bread is created from a sourdough starter which consists of flour and water. Over a period of days of fermentation and with repeat feedings of flour and water, organisms will begin to propagate. As the lactobacillus ferments, lactic acid is created which increases the micronutrient profile of the starter. Nature takes its course; natural enzymes are broken down and enough yeast (leaven) forms to make bread rise. This starter is added to the dough and left to rise for several hours, creating that perfectly aerated bread with a crunchy, springy crust. How is sourdough bread better? When you look at a grain in its natural state you notice it has a very hard husk to it which contains phytic acid. In humans this phytic acid can inhibit ezymes which are needed for breakdown of proteins and starch in the stomach and affect your ability to absorb valuable nutrients such as iron and calcium from you diet. These lack of ezymes can create digestive issues along with malnourishment. The wild yeast in sourdough and the lactobacillus in the starter neutralize the phytic acid. This prevents the effects of the phytic acid and makes the bread much easier to digest and allows the nutrients to be delivered much better to the body. This is why when you eat a piece of traditional sourdough bread you feel more satisfied compared to if you were to have some commercially risen bread. The body gets the nutrients much easier and digests the bread better. Phytic acid is problematic because molecules bind to other minerals such as calcium, magnesium, iron and zinc which end us inhibiting your bodies ability to absorb them. However the long slow fermentation with sourdough reducing the phytates by up to 90%. Sourdough bread is also slower to digest, which is great for helping to stabilize blood sugar and create much longer lasting energy from your meals. The natural acids slow down the rate at which glucose is released into the blood-stream and lower the bread’s glycaemic index (GI), so it doesn’t cause undesirable spikes in insulin. The fermentation of the bread also helps support gut health with the sourdough bread being a great prebiotic. The traditional method of making sourdough is a lengthy process. By the 20th century ready-made yeast was available and updated industrial processes allowed for speedy mass bread production. Instead of a long fermentation time of up to a month, commercial bakers where able to churn out bread loafs wrapped and ready for the shelves in just three and a half hours. To produce a loaf of fluffy, white bread in the minimum time, bakers were required to add a whole list of additives. Gluten, yeast, fat, reducing agents, emulsifiers, soya flour, preservatives and enzymes were added to the recipe to speed up time, improve texture and increase the shelf life. Modern bread that sits on your supermarket shelves avoids the long fermentation process and contains large amounts of unfermented gluten. It therefore skips the process that allows the natural bacteria to breakdown the gluten and carbohydrates, making the bread easier to digest and the nutrients more easily absorbed. 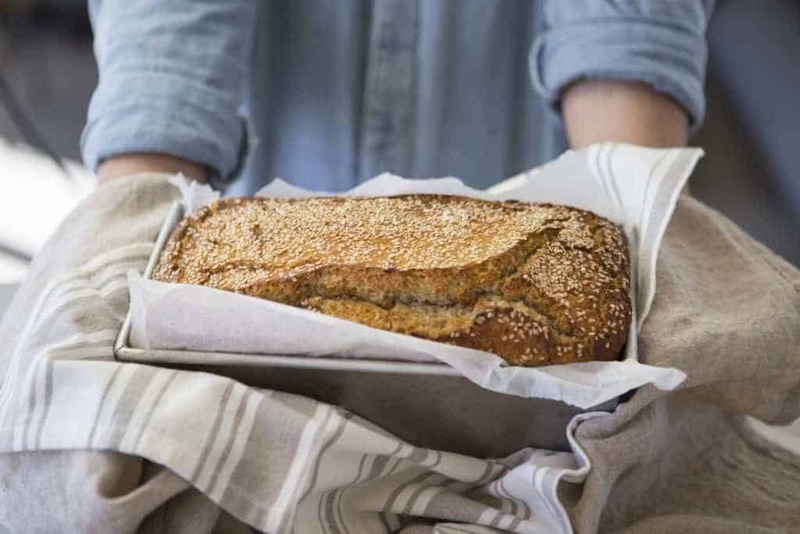 It’s hardly surprising that this factory-made form of bread has been linked with a whole collection of conditions including coeliac disease, gluten sensitivity, autism, diabetes, cancer and Alzheimer’s. Before you get put off though, the actual making time of the bread is less than 10 minutes, the rest is letting mother nature do its magic. The slow fermentation process and the production of wild yeast and lactobacillus neutralises the phytic acid found in the wheat. 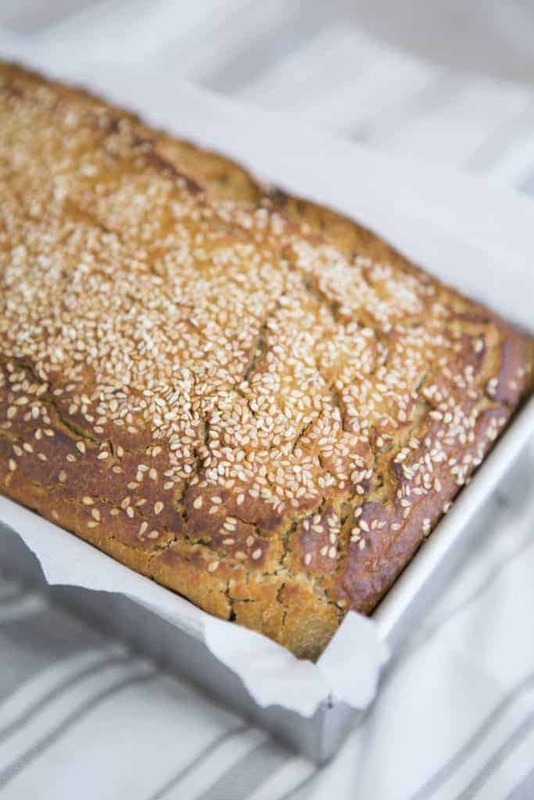 By reducing the effects of phytic acid the bread is easier to digest and important nutrients like magnesium, zinc, iron and B vitamins including folic acid are more readily absorbed. Sourdough bread also produces a lower spike in blood sugar levels when compared to other breads. This makes it a better alternative to diabetics and those suffering from insulin resistance as it will produce a lower glucose and insulin response. More of the gluten in sourdough bread is broken-down in the fermentation process, rendering it virtually harmless. Therefore, many people with a gluten intolerance and some coeliacs can consume sourdough without suffering their usual complaints. 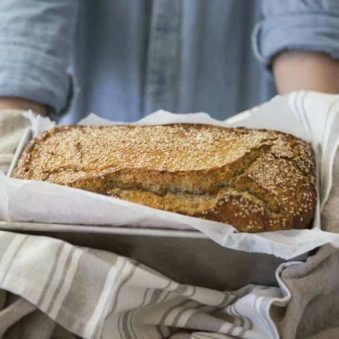 With the rise of people suffering from gluten intolerances, we’re seeing the return of small artisan bakers welcoming the demand of sourdough bread. However, we’re also seeing supermarkets moving to capture this area of the market by producing their own line of sourdough loaves. Unlike the loaves from your local artisan baker, these commercially baked breads are likely to be a modern form of sourdough: ordinary, fast rising bread with a small amount of powdered starter. Surprisingly, there’s no legal definition of “sourdough bread”. So, my advice is to find an artisan baker in your area and ask about the fermentation process of their sourdough. If you’re gluten sensitive, chances are store bought sourdough bread will still cause upset and just won’t cut it. Better still, experiment with making your own sourdough starter and bread. 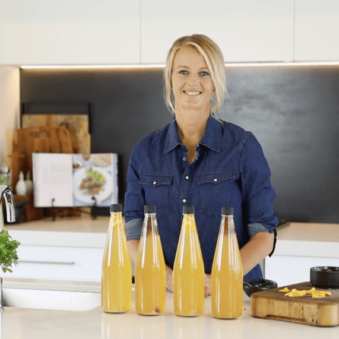 It’s a great opportunity to learn more about fermentation, microbes and the health benefits. And who doesn’t love the smell of freshly baked bread as it comes out of your oven! 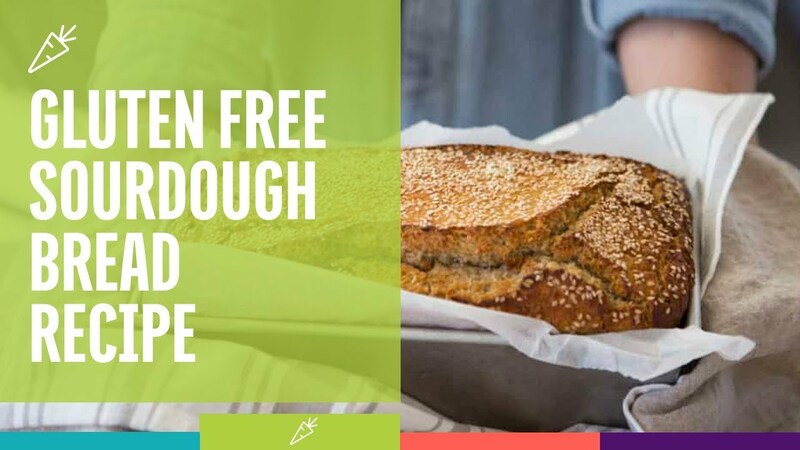 For many gluten intolerant people they find that normal sourdough bread is fine due to the way it is made, however sometimes this can still create some irritability and that is why we created this Gluten Free Sourdough Bread Recipe. Not only is it slowly fermented which makes it much easier to digest, its packed full of nutrients and tastes great. The slow fermentation of the flours make the bread easy to digest which allows the nutrients to be used much easier by the body. Meaning you feel satisfied and full having a slice of this bread. Please note in the video I say 4 tablespoons of salt by mistake. Oops! Mix dry ingredients together with a whisk. Make a nest and add the wet ingredients. Note: Regulate the amount of water you add to achieve the correct consistency, start with 1 cup then add more as you mix. You want a wet pancake batter type consistency. Not too dry and doughy otherwise bread will be crumbly. But also not too runny. Just right. Mix vigorously for 1 minute with a wooden spoon. You want air to get into the mixture. Put mixture into bread baking tin pre-greased with butter. Cover with tea towel and leave at room temperature to rise for 6-8 hours. Be patient as this step is super important otherwise you will have bread that is as dense as a brick. After this period, put into pre-heated oven at 190 degrees celsius (350 fahrenheit) on fan-bake for 50 minutes. Put 1 cup of boiling water in a roasting tray that sits underneath the mixture. This will add steam inside the oven to give the bread a crispy crust. Add ingredients into a large glass bowl. Beat with an egg beater/whisk vigorously to try and get air into the mixture. Cover with a tea towel and leave at room temperature in cupboard or on kitchen counter. No direct sunlight or huge swings in temperature. Every morning and night add 1/3 cup brown rice flour and 1/4 cup water to the mixture to ‘feed it’. Beat vigorously with egg beater each time. Do this for 6 days or until you see bubbles appearing on the surface. Be patient! I tried to bake bread with the starter after only 2-3 days and the bread was a dense brick. Sourdough starter is now ready to use to bake bread! After 6 days you can ‘feed’ starter only once per day with 1/3 cup brown rice flour and 1/4 cup water. If not planning to use starter for a week, put it to sleep in the fridge. When ready to bake again, put it at room temperature for a day before you are ready to bake and start ‘feeding’ it again.